Since I’ve started freelance web design back in 1998, a majority of my clients have been composers. It’s not often, however, that I get a chance to develop a website for a critically acclaimed Oscar-winning composer who is on the shortlist for nearly every major project. 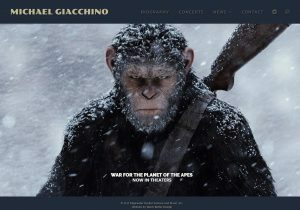 And so it was that I built a website for Michael Giacchino. Working fast, this site was just “Phase 1” of a larger project that will extend into the fall. The design of the site went through an evolution; at one point I had actually taken photos for texture and color elements from Michael’s home studio, but it was decided to go simpler than that. With two major features coming out in July (Spider-Man: Homecoming and War for the Planet of the Apes), we wanted to get something launched quickly – a basic site with an official bio, some news, concert information, and a slideshow. There’s a major birthday celebration at Royal Albert Hall in October coming up, we’ll be working hard to get Phase 2 launched in September which will have a lot more content. Stay tuned!